I'm not a big fan of gun disarm techniques for obvious reasons. A while back I posted about a murder trial that involved Chuck Norris testifying for the defense, demonstrating how to disrupt a gun wielder. 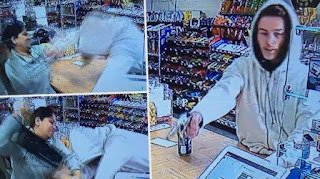 This past week, a cashier working at a convenience store in Georgia (US) thwarted a 17-year-old robber brandishing a gun. 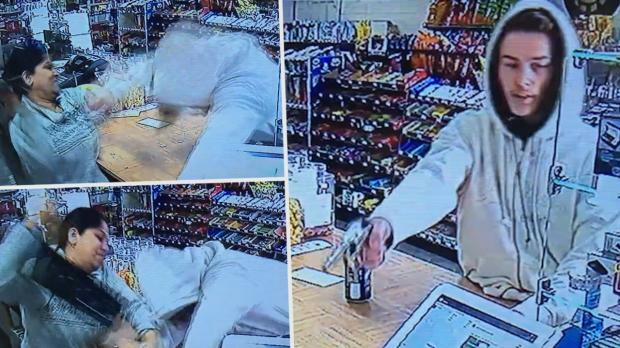 Bhumika Patel was ringing up the youth's purchase of soda when he flashes a gun in her face. Attempting to slap the weapon away, she hits him over the head with the cash drawer and then promptly chases him out of the store with a hammer. The suspect was caught later. Christian Thornton faces charges of armed robbery, aggravated assault and possession of a firearm during a crime. Check out the video here. Everyone is hailing her as a hero. I think she's more crazy than heroic. I'm guessing this was not her first rodeo — who knows how many times this store has been robbed or shoplifted — but this could have ended tragically very easily.